Paul Martin’s American Grill has been the latest addition to the Pasadena area on the popular Lake Avenue. The resturant just opened a month ago, and I finally got the chance to see the new space and taste the food! Paul Martin’s is an extremely elegant, upscale location with an impressive charcuterie station, weekly specials, including daily happy hour from 3 to 7 p.m., the Tuesday Fried Chicken special, Sunday brunch and Sunday’s Prime Rib dinner. For those that have never been to a Paul Martin’s before, the restaurant is known for only using seasonal produce, seafood from sustainable fisheries, and free-range meats and poultry, with no item frozen or precut. Everything is made from scratch everyday. I was invited to try out their popular dishes. We got the party started by tasting some of the cocktails at Paul Martin's. The restaurant had a full bar menu of hand-crafted cocktails with house infused spirits, and the Paul Martin’s celebrated wine list of more than 100 labels, with 80 available by the glass will also be offered. Three standouts for me were the Raspberry Martini, the Classic Mojito, and the Peligroso Blanco Margarita. First, I tried the Smoked Salmon grilled crostini with horseradish cream. The salmon is smoked daily in-house and it's absolutely divine. One of my pet peeves is dry fish and this salmon was very moist and flavorful. The Smoked Salmon is part of Paul Martin's Happy Hour, which is served from 3-7 pm daily. This is a dish that is unique only to their Happy Hour menu! Next up was the Salt & Pepper Shrimp, lightly fried with pesto aioli. In addition, I also loved the Butcher's Board , which had a selection of local cheeses and artisan salumes. Here's a glimpse of the impressive charcuterie station. You can see all the meats hanging in the red fridge in the back. It was amazing! I love a good charcuterie and Paul Martin's most definitely delivered. As for entrees, there was the Braised Short Ribes with mashed potatoes, horseradish cream, and beef jus. The Chimichurri Chicken, chicken breast, wild mushroom faro, cipolline onion, blooms dale spinach. I love faro! Delicious! 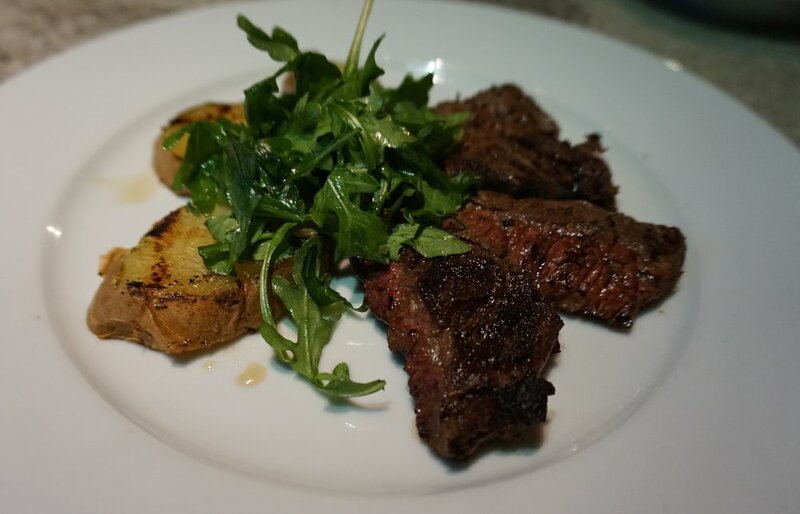 And let's not forget about the Marinated Skirt Steak with grilled sweet potatoes, maple bourbon glaze, dressed arugula. When it came time for dessert, I was rolling from all the food. Then again dessert goes to another stomach, right? At least that's what I constantly tell myself! I downed a Banana Cream Pie, which was heavenly. The touch of fresh whipped cream was amazing. In addition to that, I also had a apple crumble pie with vanilla ice cream. It's not a true meal until you have chocolate! Paul Martin's Devil Food Cake with three layers of rich ganache took my heart. The cake was made from cordillera chocolate and the am arena cherries were reason enough for me to finish the whole cake! I'm so glad Paul Martin's is now in Pasadena on the popular Lake Avenue! I can't wait to go back again! Paul Martin's has a great Happy Hour. What's also unique about them is that there are a number of dishes that are only available during Happy Hour.